← Where in the world is cigarbox ukulele, Olivia? It’s been a while since I’ve sat at a computer (the break was great) and checked out a range of blogs I enjoy. Of course, there are new links to follow every time. After a late morning I started with Dudecraft which lead to DesignMilk‘s falling leaf designs which led to Dog Milk which led to “Boogie on Instruments.” You can learn about Lili Chin and her inspiration, Boogie. My favorite is, of course, “Boogie on the Ukulele“. Lili sells the prints. 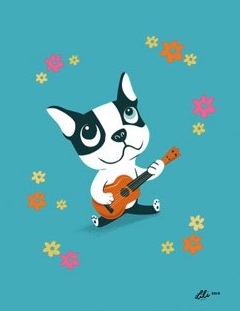 This entry was posted in Perspective and tagged a sense of perspective, art, dog ukulele, illustrations, leaf designs, lili, music, ukelele prints, ukulele, ukulele art. Bookmark the permalink.